Have you ever fletched an arrow and later discovered that the vanes do always rip off at various times? Trust me; I have been in this situation to the extent that I even got tired of the whole thing. However, I discovered a perfect solution to this problem. And that was the use of best fletching glue. Not just anyhow glue, but the ones that had a tough and super impact without taking much time to bond. There is a lot of fletching glue on the market. But how do you know which one is right for you? 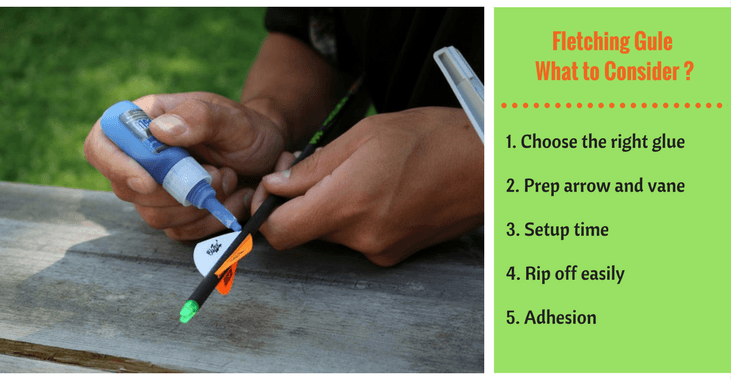 Here are a few tips you should consider when shopping for a super fletching glue. For a super hold, you want to go for adhesives that will stick and match up to the vanes. A great example is using Aae Vanes with Aae fast Ser Gel coupled with Loctite Super Glue for inserts. Judging from experience, this combination is going to give you excellent control of flow and firm bond. The key to successful glue usage is proper arrow shaft and vane prep. When you are putting vanes on wraps, your glue is only as good as the glue on the wraps. So extra care should be taken to make sure the shafts are clean before you install the wraps. Before buying a fletching glue, you have to consider the setup time for that particular glue. Typically it takes a few minutes. There are some glues that actually takes longer time to cure and at the same time makes a powerful bond. Such glues do work amazingly well, but often get ineffective or brittle over a short period. For such types of glues, we suggest that the shaft needs to be properly prepped by scrubbing with a green pad. After that, you want to wipe with denatured alcohol. Ensure you don't touch that particular area. While some super glue may turn out to be a mess when used for fletching, due to excess application, we suggest you have full control of the glue when applying it. Another about thing you have to take note of is the strength of the glue. You’ll need to find out if the fletch glue works flawlessly when fletching arrows and if it can be easily reglued. Find out if the Super glues are perfect for inserts and has the ability to hold up pretty strong. Currently, there are two types of fletching glues on the market. They are Cyanoacrylate (CA) and Solvent-Base. Let's see fletching glue vs super glue. The CA glue is an acrylic resin that contains molecules that link up when in contact with water. You will notice that this glue whip around the chain to produce a plastic mesh. The glue is typically thick and hardens up until its thrashing molecular strands fail to move. Although, they are strong, cannot withstand unfavorable elements like cold, heat and humidity, and temperature compared to solvent based glue. If you want to refletch your arrow, they are most times difficult to remove. It offers a durable bond that can resist any weather and shock conditions compared to CA glue. One major issue with Solvent-Based glues is time. You have to give it some time to dry up before shooting. It takes a longer time than CA glue. 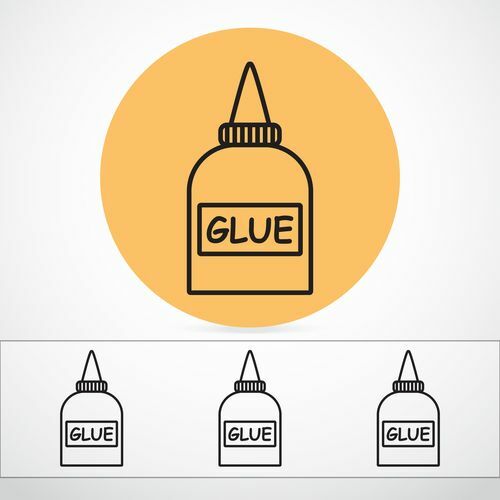 If you want the most in your glue, then pay close attention to your arrow and vane. The amount of a stable bond you will get from glue will be determined by how well it holds on the wraps. 1. The first step is to scrape off all old glue and vanes with a knife. Ensure you don't damage the shaft while doing this. But if you are not comfortable with this method, you can use an Acetone to get the remaining glue off. 2. However, don't allow the portion to soak in as it may likely damage the shaft. 3. After that, we recommend you put the shaft under warm water, and then use Green Scotch Brute to gently rough them up. 4. When you are done with that, dry the shaft up with a piece of cloth or towel to get any residue of glue off the Green Scotch Brite. 5. Clean the area with 98% Isopropyl Alcohol that has no oils or scents. 6. you want to add a bead of glue on the vane about ⅓ of the width of the base. A few beads can also be added to the glue, after that you can evenly spread the glue, using a toothpick. 7. Place vane in a jig, then press it into the shaft to ensure there's no movement. Ensure you let it sit for one minute to get the maximum bond required. We have reviewed the best 5 Fletch and Super Glues we have tested and can boldly tell you that you’re going to have a field day using them. Gorilla super glue is one of the best super glue we have ever used without any hassle or whatsoever. The setup time of this glue is almost instant, and it Adhesion seems to blow other brands out of the water. You don't even have to sand the wraps and vanes to get an excellent Adhesion when using Gorilla Glue. After applying it on the layer of the vane, we had to give it some few minutes to dry off, and then later tried to rip it off, but it was so stubborn that we didn’t even notice any budge. One would think that a glue of this magnitude would be expensive. But that isn't the case with the Gorilla Super Glue as it is cheap and affordable compared to other brands. The best part is that you’ll get more glue from it than in most brands that come with a higher price. That means a bottle of gorilla super glue can last you for a long time than using other products. The Setup time is almost instant that you can start removing the clamp after applying the glue in one or two minutes. You have to shake before use. Otherwise, the glue would run out excessively, which will lead to reduced Adhesion. We recommend you shake after using it for 4-6 vanes or every minute. With that said, you need to have full control while applying the glue to prevent putting way too much glue. However, if you have excess glue on your vane, you can wipe it off by using a Q-tip. The Glue spreads easily and nicely than other competitors. Aae Fastest is an-all-purpose glue that is popularly known for its ability to hold fast on anything by sticking them together. Just like the Gorilla Super Glue, Aae will bond vane to an arrow shaft in seconds. Another beautiful thing is that it also beads out effortlessly from its container without messing your vane.​ Our test revealed that it only takes 1 minutes to set up and will also let you use a single-clamp jig. That means you can fletch a bunch of arrows in less than an hour without the fear that your vane is going to rip off. Unlike other dispensers, the Aea provides an incredible small bead. You can also use this glue on vane and feathers. It whitens and discolors some shafts when you use it to glue vanes on bare carbon. After a year of usage, the bond might start losing its grip from the vane. This solvent based glue is one of the few adhesives that dries clearly, offers you more working time and works perfectly in low humidity. The Gel is designed for feathers and vanes on carbon, wood, aluminum and fiber shafts. Loctite Ultra Gel holds a record as one of the best rubber toughened super glue that resists shock and vibrations. Of course, this super glue comes with a lot of durabilities. The BSI CA Super Glue is an excellent Gel for bonding plastics, fiberglass, metal and hardwood. With an industrial strength, this glue provides a solid bond of your vane to the shaft. 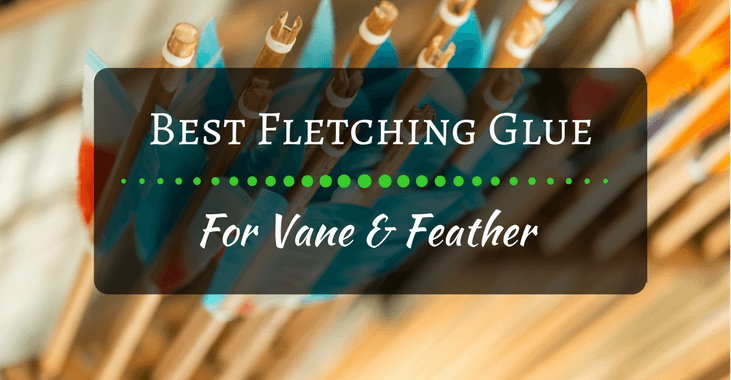 If you are looking for the perfect fletching glue that will solidly hold your vanes without them ripping off, then these are the best glue you can try to today. Easy application without dripping or causing a mess. Offers great flexibility and durability. So, there you have it. Let’s know what you think about our list. We would love to hear your thoughts on the different best fletch glue you have had the chance to use.